In honour of my birthday this week, I wanted to share a couple of my favourite fantasy books from when I was growing up. When I was younger, I absolutely loved unicorns. 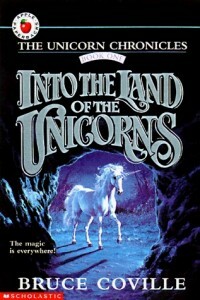 So I was really excited when Into the Land of the Unicorns by Bruce Coville came out; Into the Land of the Unicorns is the story of Cara, a young girl who is thrust into the magical unicorn-filled land of Luster by her grandmother when the two of them are pursued by a mysterious man. It was the first book in Coville’s Unicorn Chronicles series; the other books came out with about a decade between them. So over the years I’ve read this book many times, rereading it every time the next book in the series came out. There is something about the way Coville wrote this first book that remains magical even to this day. I’m sad that Coville never managed to recapture the magic of this first book in the later books within the series, most likely because they were written so far apart. Here’s a couple of fun facts: first, Into the Land of the Unicorns was one of the only fantasy books I managed to get my mom to read – she enjoyed it too. And second, I was really excited to hear that my best friend from elementary school, who also loved Into the Land of the Unicorns, told me he recently got it for his young daughter to enjoy once she’s a bit older. 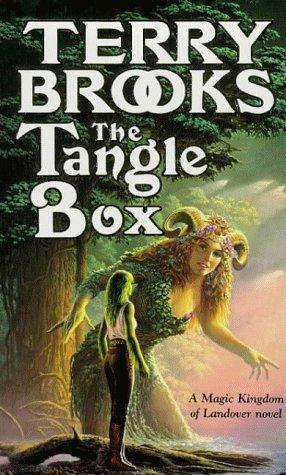 One of my all-time favourite books is Terry Brooks’ The Tangle Box. I remember finding as a paperback years ago at the Brodie Library. I was cruising through the fantasy paperbacks when I found the fifth book in the Magic Kingdom of Landover series, Witches’ Brew. It looked exciting because it had a big dragon on the cover. Finding The Tangle Box, which was book 4 in the series, I decided to take both of them out. Well The Tangle Box was a phenomenal fantasy read. It’s split into two stories: one following Ben Holiday, the king of Landover who bought the kingdom for $1 Million; Ben ends up trapped in the mysterious Tangle Box along with the dragon Strabo and the witch Nightshade. They have no memory of who they are. The second story follows Ben’s wife Willow, who is pregnant with their child. Willow is on a quest to gather the soils from three worlds, which she needs for her pregnancy. She’s guided by Edgewood Dirk, a hilarious faerie cat. I loved both parts of this book. The Tangle Box set me onto reading all of Terry Brooks’ books. And in case you were wondering, I didn’t like Witches’ Brew nearly as much as The Tangle Box. You really can’t judge a book by its cover. This was the exact cover my teacher lent me. Years ago, a teacher brought me a copy of Watership Down by Richard Adams to read. 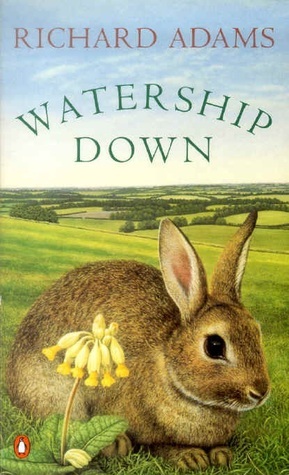 Based on the name (and not knowing what a “down” was), I thought the cover with a bunny in the middle of a field was rather strange for a book about a boat sinking. Then I started reading, and it quickly became apparent that this was definitely NOT a book about a boat. Instead it’s the tale of several rabbits who leave their warren to establish a newer, safer one. While this premise may not sound very exciting, let me assure you that Watership Down is a fantastic adventure story, even without all the drama on the high seas that I was expecting. While all different, these three books have managed to stay with me through the years. All three are well-written adventure stories – I hope you’ll consider giving one of them a read.